At Hi Mountain Bison & Buffalo Hunts, we're excited to have you visit our ranch and to help you experience the thrill of hunting a buffalo for yourself. We look forward to having you and want your hunting reservation to be everything you're looking for. That being said, there are a few things you need to be aware of regarding safety before you come which will greatly improve your experience when you arrive and while you are here. When hunting a buffalo or bison, safety is incredibly important. American Bison are large, heavy, and can behave erratically and aggressively when approached without the proper caution. A buffalo is capable of sprinting at 30 mph, which is about three times as fast as you can run, and they can range in weight from a few hundred pounds to nearly a ton. Both male and female bison grow dangerous horns and regularly fight with them. To get an idea about what you'd be up against if you went head to head with them, have a look at some of our herd. 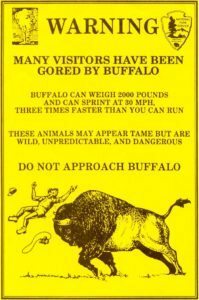 You do not want to be gored by a buffalo, and we don't want you to either. For that reason it is important that you follow any and all safety instructions given to you during your hunt, especially if you are advised to back off or away from a buffalo. In addition, safety does not end after you've shot your buffalo. Members of the herd are likely to attempt to protect a wounded bison, and you should not attempt to go into the herd after your animal until your hunting guide tells you it is safe to approach it. If you've had any experience hunting before, we also hope that you will be safety conscious when it comes to handling your firearms and are aware of what lies beyond the buffalo you are shooting at. Because of safety risks we will not allow guests to bring children younger than ten years old with them during their bison hunt, although you are welcome to have younger children with you during your stay with us. Please also be aware that alcohol, hunting, and guns do not mix, and they certainly don't mix around a herd of buffalo. If you would like to enjoy some alcohol during your visit with us we would ask you to wait until after the hunt has been completed so that we do not have to cancel or delay your hunt. If you have additional questions about safety that you would like us to answer, please contact us or give us a call. We want you to have the best time you can while you're here, and we know that hunting a buffalo will be a dream come true for many of you. Happy (and safe) hunting!